To celebrate the anniversary of Belgrade's liberation from Nazi occupation, the Serbian capital hosted its first military parade in nearly 30 years. Some 4,500 troops participated in the event, which was attended by both Serbian and Russian leaders. Speaking at the festivities, Russian President Vladimir Putin – who was a guest of honor at the parade – said that although the Soviet Union was responsible for the fight against the Nazis, Russia has "never divided the victory into 'its own' and 'foreign,' and will always remember the help of allies by the anti-Hitler coalition, the participants of the resistance movement." "It's our common duty to remember the lessons of World War II, to stand against attempts of Nazis and their associates’ glorification, to join efforts in creating an atmosphere of trust and understanding on the European continent," Putin added. The parade, which was held after a 29-year break, became the 24th in Serbia's history since the Nazi invasion. 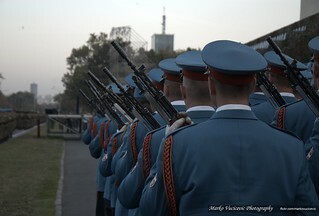 The event included 4,500 Serbian troops out of the country's 36,000-strong army. It also featured around 200 military vehicles. World famous Russian aerobatics team Strizhi (Swifts) also participated. "Your attendance...is an honor for us, and a symbol of our collective glorious past, present and future," Serbian President Tomislav Nikolic said while addressing Putin. In an interview with Rossiya TV channel, the leader of Serbia also pointed out that the two countries fought on the same side in both world wars, and that "Serbia's survival as a nation was at stake" both times. Putin visited Serbia on Thursday to discuss key issues regarding the two countries' joint cooperation. At a press conference in Belgrade, the Russian leader also invited Serbian officials to attend the annual Victory Day parade in Moscow next May, when the country will be celebrating 70 years of Nazi defeat in World War II.